Complimentary beverages and snacks are available in your hotel room upon check-in. 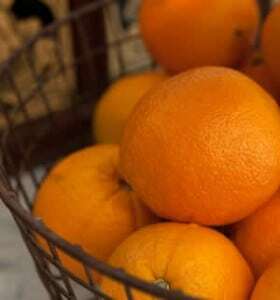 We serve hot coffee, tea, and seasonal fresh fruit daily. Several breakfast, lunch and dinner restaurants are located within walking distance of Hotel California. Hotel California offers a full working kitchen available to guests staying at the hotel and stocked with everything you need to make your breakfast, lunch or dinner. All you have to do is the grocery shopping! Indulge your inner Emeril or Bobby Flay with the wonderful fresh foods available in the bountiful Southern California region. Don’t worry about the dishes, pots and pans, utensils, stove, refrigerator, etc., it’s all ready and waiting for your culinary journey. Hotel California offers two gas bbq’s if you want to grill your dinner at the hotel. Many nights our guests enjoy the pool and the each other’s comradery around a fire pit. Bring your own beer or wine and join us for a night in, under the deserts ample stars. We’re Livin It Up At.. the HOTEL CALIFORNIA..
You can check in any time between noon and 6, but you’ll never want to leave! Fabulous restaurants and street cafe’s are the highlight of many guest’s visits to Palm Springs. We take pride in offering recommendations to our guests to meet the selections of their choice. Cheeky’s – Seasonal weekly menu, fresh local ingredients, Outdoor patio…try the bacon bar! 622 North Palm Canyon Dr.
Melvyn’s Ingleside Inn – For a “blast from the past” 40-50’s style… A Brunch MUST. Pinocchio in the Desert –All American breakfast joint AND $3.95 bottomless mimosas! Johannes Restaurant — Chef and owner, great for foodies and an Intimate Wine Bar. LG’S Prime Steakhouse – One of a group of family-owned steakhouses featuring clubby rooms & 9 different USDA Prime steaks. Spencer’s – Excellent wine list. Voted Best of Palm Springs. Romantic patio seating. 533 Viet Fusion – Casual setting for a mix of modern & traditional Vietnamese dishes, plus a cocktail lounge. Sherman’s Deli – NYC-style deli serving kosher fare from morning to night, with specialty cakes & other baked goods. Tyler’s Burgers – A local favorite for the BEST burgers around. Make sure to order the Cole slaw! Native Foods – Chef Tanya prepares such good food even Carnivores love this place. Palm Greens Cafe – Organic ingredients, featuring vegan, vegetarian & gluten free options.